To those tired of their smartphone's stock, un-touched interface, worry not, as Android launchers are in abundance. A novel one that we just found about is LightLaunch, and what we loved about it can be summed up in a single word - fluidity. 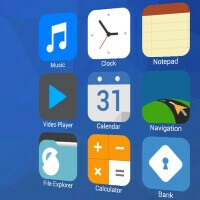 LightLaunch gets rid of the Android app drawer and places your icons on a 3D-rendered pane that moves swiftly together with your finger swipes. Things are kept clean and simple, which means there's not much in the way of visual eye candy to ingest, but special effects do tend to get in the way of doing actual work, anyway. Uncanny fluidity aside, LightLaunch has other stuff going on under the hood. In addition to letting you use third-party icon packs (unlocked for $0.99), it has the option for quick and leet icon scaling — simply make a pinch gesture and inflate the icons, or shrink them to miniatures and fit up to 7 icons in a row. And then comes the variety of customization options. You've got Style, Effects, Scrolling, and Advanced pages that have a fair amount of options to tweak each. It's stuff like tilt & zoom amount, text size and color, scroll speed (brake, fling, speed), nav/status bar transparencies and some other things that you should feel free to experiment with. LightLaunch is free and available from the Google Play store.